When we started this project a year ago, we had a vision but no experience or technical skills in blogging. We also had no funding but insisted on financial self-reliance as a guarantee of independence. Learning on the job has been hugely entertaining and rewarding but keeping the site going and up to standards despite professional and personal commitments has not been an easy business. In line with our aim to promote an independent conversation between opposing views we tried to publish the broadest range of opinions on a variety of topics and we are still working hard on expanding our list of contributors and our readership from across the spectrum. There were also mistakes and the realisation that the Arab readership, in general, was even more divided and less keen to engage in a productive dialogue than expected. The trend so far had been to choose instead the comfort of debating those who agree with us or trading insults with those that do not. Encouragingly, regardless of the heated words the language used on our site remained mostly civil. The controversial topics continue to be the attitude vis-à-vis the Arab-Israeli conflict, Lebanese internal politics, The US-Iran confrontation, the role of Religion and the nature of the state. Along the way we have been called ‘Traitors’ by a self-styled Arab Nationalist, ‘Anti-Lebanese’ by another self-styled Lebanese patriot while others labelled us ‘pro-Western’, ‘defeatists’ ‘Zionists’ and ‘corrupt’. The reality is that we are none of the above. We stand by our Arab identity but a modern, secular and egalitarian one with an emphasis on human rights and self respect. We choose democracy not as an imported imperialist concept but as a natural order of things through which individuals and groups can thrive and prosper. 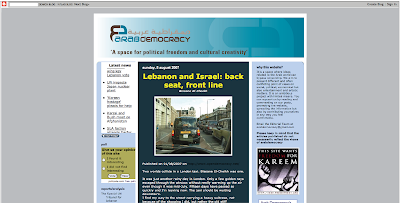 Arab Democracy is not an ‘oxymoron’ as one of our readers mentioned, it is a destiny. The road ahead might be a long one but it has been tread by many before us, and at a high cost. We owe it to them to continue in their footsteps despite the frustration and adversity. We finally thank those who have contributed over the past year, whether they have supported or criticized us. Every contribution is also an affirmation of Democracy and we urge you to continue. Our commitment for the next year will be to improve and provide an interactive and informative space where everyone feels welcome.